L. Frank Baum was born May 15, 1856 in New York. He is best known for the book he published in 1900, The Wonderful Wizard of Oz, an American fairy tale. I read this book to my boys when Elijah was in first or second grade. A few months later we went to a play, The Marvelous Land of Oz, and a homeschool program where the instructor (a true lover of all things Oz) informed Elijah that there were gobs of Oz books. She even teased him with pieces of the future plots. Elijah persistently asked me to buy the books for him, and over time we collected the entire series–some of my fantasy-loving boy’s favorites. We encourage you to read the book, if you haven’t ever done so. It’s a different experience than watching the movie. After you read the book, you can extend the learning with our (yes, Elijah helped with this!) 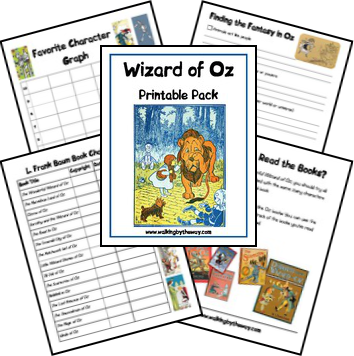 Wizard of Oz Printable Pack. 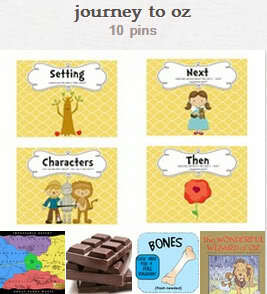 I also have a pin board ~ Journey to Oz where you can find more ideas to dig deeper into this book. I had no idea there were so many stories in the series! Thanks so much for enlightening me, I feel almost as giddy knowing this as I did when I found out there was a whole series of Mary Poppins books. Thanks for the great printables. These are great! I love the pinboard- aren’t they fun to make? I am making one for our upcoming VBS for craft and snack ideas. How very fabulous! These printables are amazing and I think that we will add this to our books to read this summer. My girls love the movie, and you are right, it is so important to read the book as well to give them a different experience. Oh, and I just started following you underneath the name, myshaenoel, on Pinterest. Can’t wait to look through all of your great ideas you have pinned!